In a day when many people believe that the gospel is simply a message about how we can have a better life, a clear proclamation of the cross and what it accomplished is among our most pressing needs. The Apostle Paul tells us that he decided to know nothing among the people of God “except Jesus Christ and him crucified” (1 Cor. 2:2). People need a consistent explanation of the cross of Christ and what it accomplished. Christ’s atoning work is the centerpiece of the gospel and the only solution for humanity’s estrangement from our Creator. 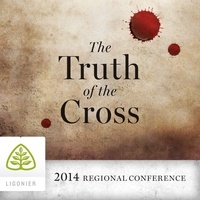 On October 3-4, we hosted our 2014 Regional Conference in Philadelphia and addressed the theme, “The Truth of the Cross.” Steven Lawson, Stephen Nichols, and R.C. Sproul reflected on the atoning work of Christ, as they considered topics such as the necessity of the atonement, the reason for the incarnation, the two natures of Christ, and several others.